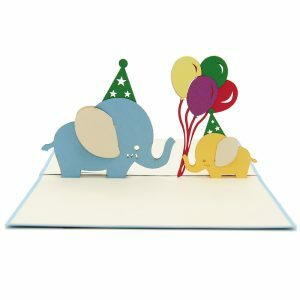 Rainbow birthday pop up card has a cream cover with two cutie birthday under a rainbow pattern on the blue part inside. The image reveals just enough of the surprise inside. We also include blank space for writing any wish you want. 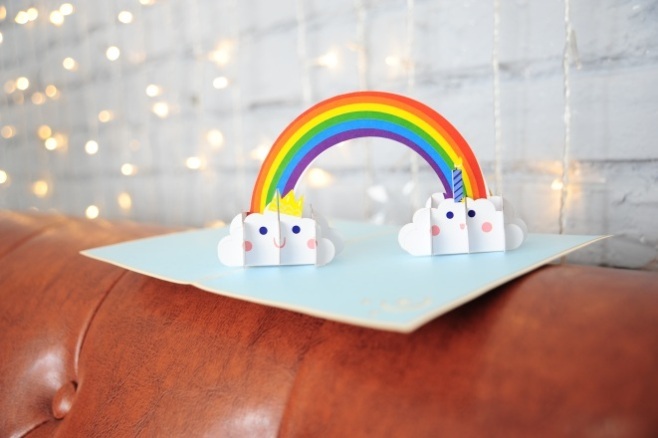 The reason for the birth of this Rainbow birthday pop up card is simple: when kids are fascinated by cute things and adults are bored with complicated patterns, we decide that a simple rainbow that seems to burst from the horizon is ideal for a small birthday gift to anybody. 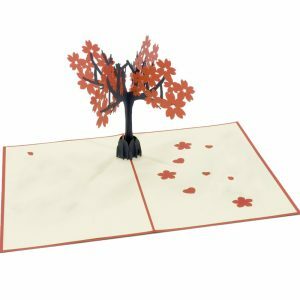 The abstract idea can be more fun with a combo of color that help kids feel more involved in nature around. 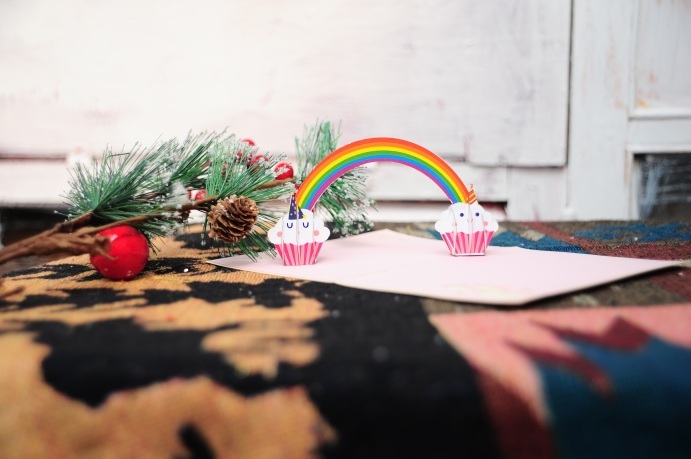 A pop-up card with birthday rainbow is always a classic but most favorite birthday card for kids. 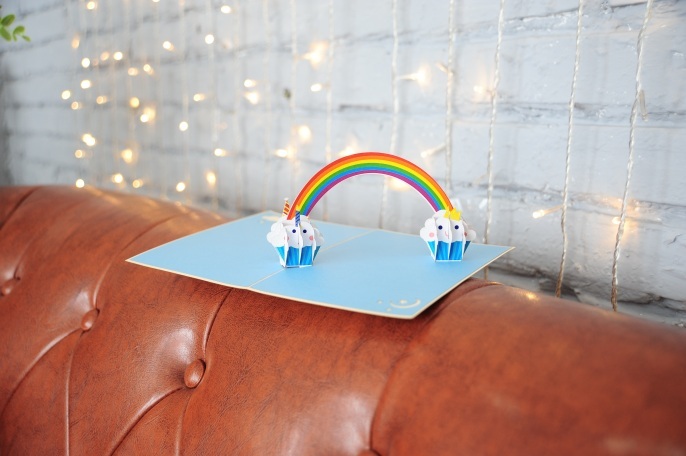 Rainbow birthday pop up card is most suitable for children, or for anyone who loves the beauty of the beautiful rainbow. 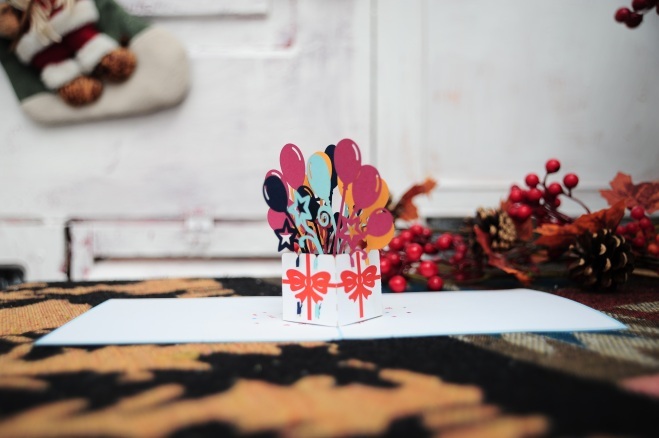 Give this handmade pop-up card to your children, friends or family on their birthday and tell them all your best wishes. Or else, to celebrate new day for LGBT community, you can also send them this meaningful card and see their happy faces. Pansy pot pop up card has a brown cover featuring a pansy pot. The image reveals just enough of the surprise inside. Open the card and we will see a pot fulfilling red pansies that are ready for a new life. That red color covering the large part also haunts you a little bit. We always leave the card blank so that you can personalize your own words. Pansies have heart-shaped, overlapping petals and one of the widest ranges of bright, pretty colors and patterns. The pansy can be either annual or perennial and this fact can be a good idea for expressing your love to your beloved partner. Our craftsmen have carefully design layers and layers of the pop-up to make the sculptures look so vibrant and bring great excitement to receivers. 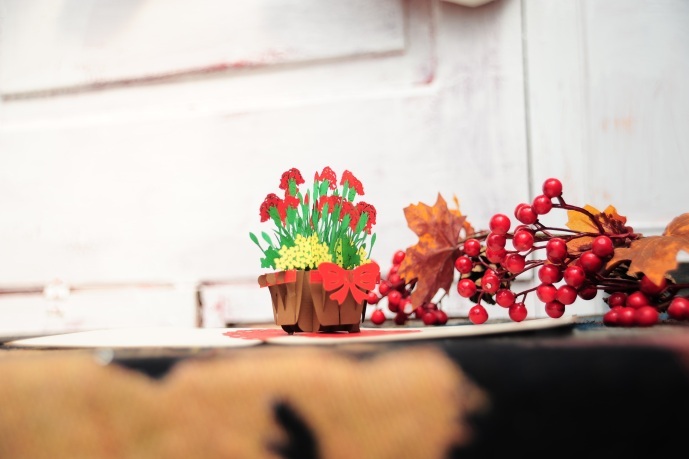 We hope with this simple Pansy pot pop up card, you will perfectly surprise any recipients. 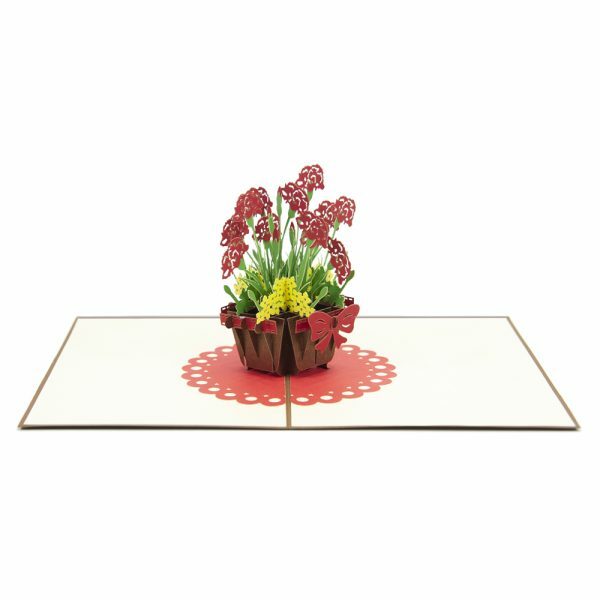 Pansy garden pop up card has a cream cover featuring an elegant pansy. The image reveals just enough of the surprise inside. 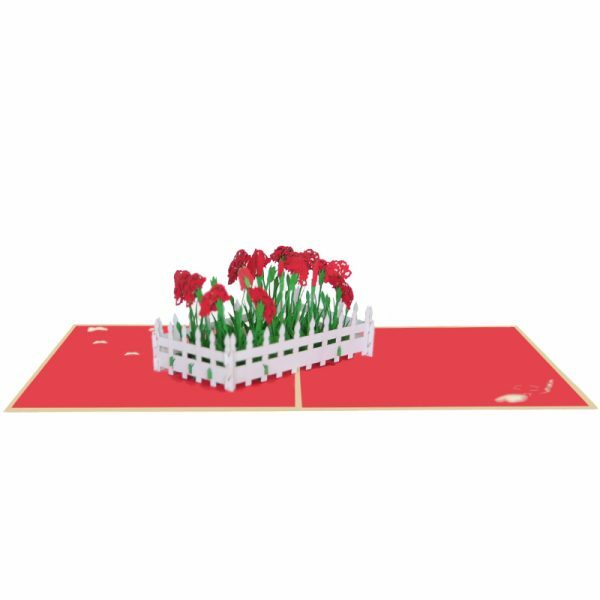 Open the card and we will see a pot fulfilling red pansies that are ready for a new life. That red color covering the large part also haunts you a little bit. We always leave the card blank so that you can personalize your own words. Pansies have heart-shaped, overlapping petals and one of the widest ranges of bright, pretty colors and patterns. The pansy can be either annual or perennial and this fact can be a good idea for expressing your love to your beloved partner. Our craftsmen have carefully design layers and layers of the pop-up to make the sculptures look so vibrant and bring great excitement to receivers. 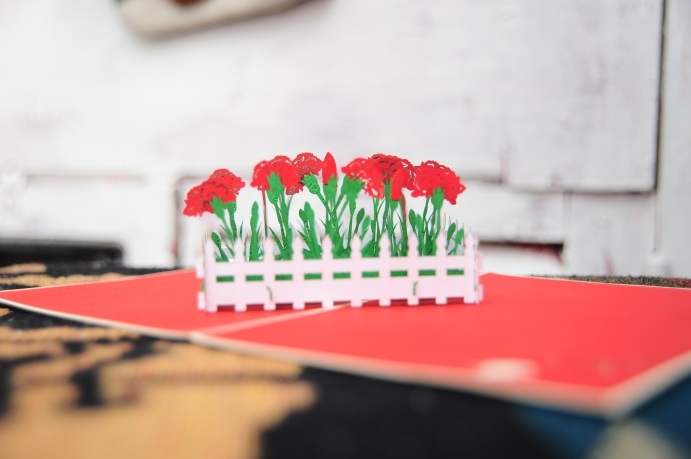 We hope with this simple Pansy garden pop up card, you will perfectly surprise any recipients. The card is best suitable to celebrate Anniversary of Love for any couple. Moreover, we can use it for Mother’s day or birthday. 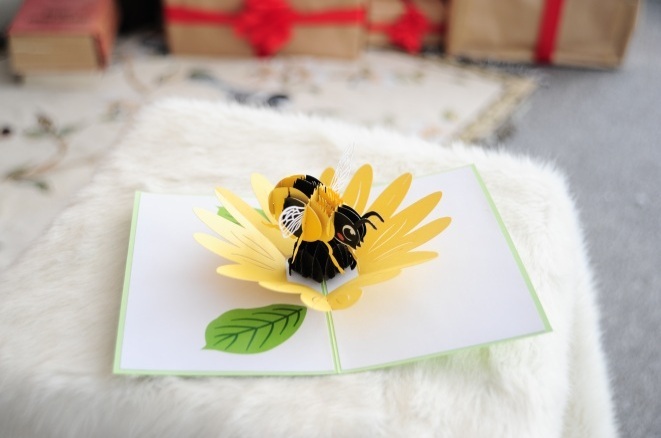 Give this handmade pop-up card to your lifelong partner or any friends to surprise them. 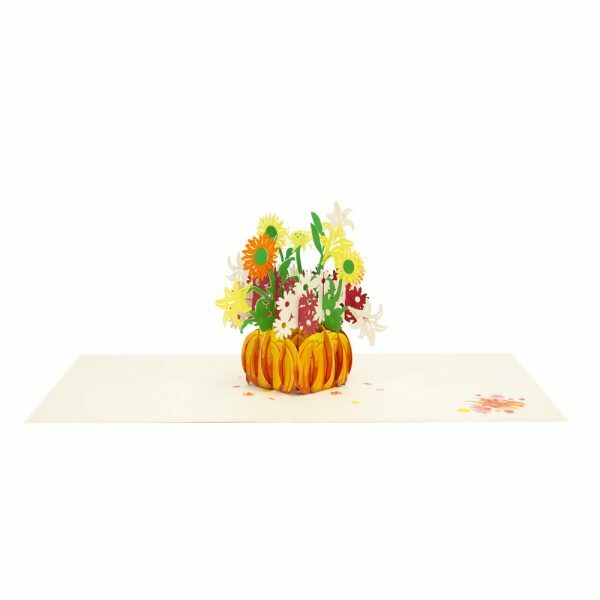 Pumpkin flower pop up card has a sparkling orange cover featuring a pumpkin pot with full of warm-tone flowers. The image reveals just enough of the surprise inside. Open the card and we will smell a fragrance of autumn when seeing a tasteful orange pumpkin with a combo of blooming flowers. This simple image will make you nostalgic. 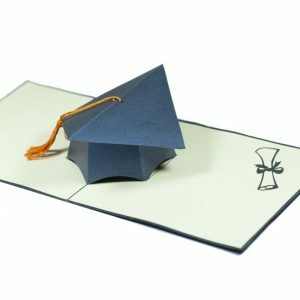 We always leave the card blank so that you can personalize your own words. Never has the autumn theme failed to inspire us, and that’s why we create this design to help you express the nostalgia towards this dreamy season. Our craftsmen have carefully design layers and layers of the pop-up to make the sculptures look so vibrant and bring great excitement to receivers. 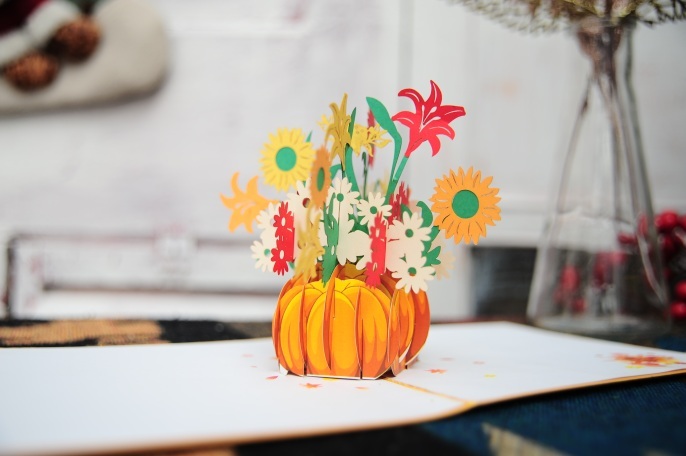 We hope with this simple Pumpkin flower pop up card, you will perfectly surprise any recipients. 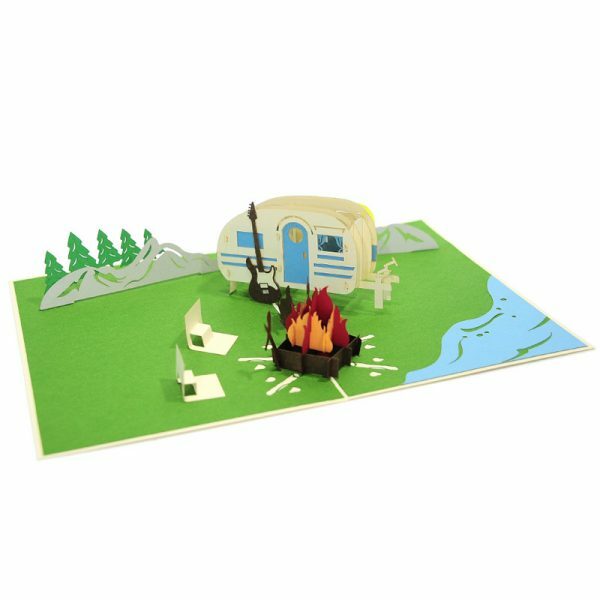 Camping trip pop up card has a blue cover featuring a peaceful camping scene. The image reveals just enough of the surprise inside. 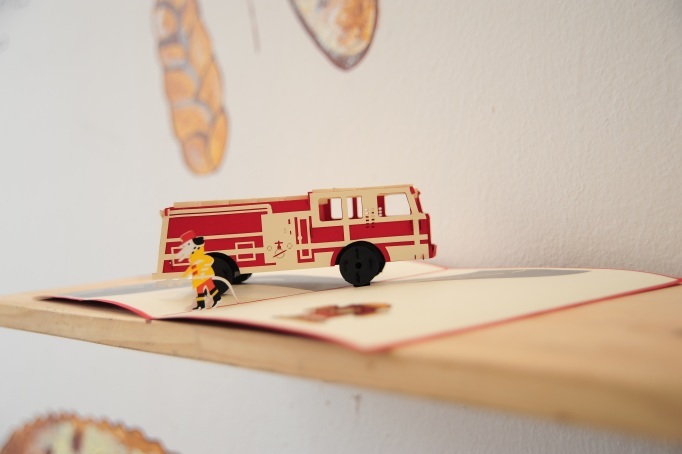 Open the card and we will see a travel van standing still next to a campfire that burns blazing yellow and orange beam. Enjoy yourself in that scene with your puppy can be one of the “Viva forever” moments that you’ve had. We always leave the card blank so that you can personalize your own words. 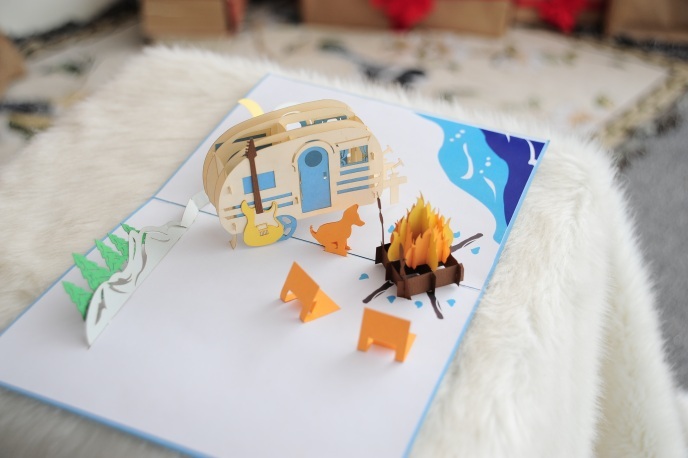 The Camping trip pop up card is inspired by a simple but surprising gift idea – a simple camping trip. The all-time favorite birthday gift for any adventurous soul is a getaway camp trip. No needs for dramatic ideas, the moment when the sculpture pops up is enough to trigger excitement. Our craftsmen have carefully design layers and layers of the pop-up to make the sculptures look so vibrant and bring great excitement to receivers. We hope with this simple card, you will perfectly surprise any recipients. 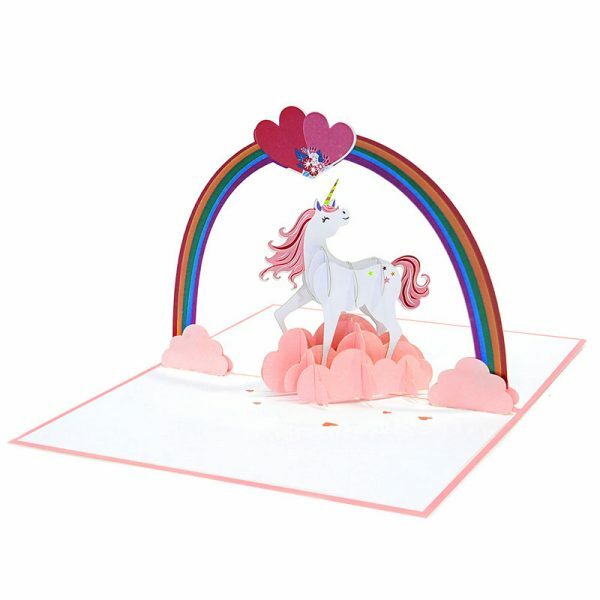 Love unicorn pop up card has a cream cover featuring a unicorn with a combo of bright color. The image reveals just enough of the surprise inside. 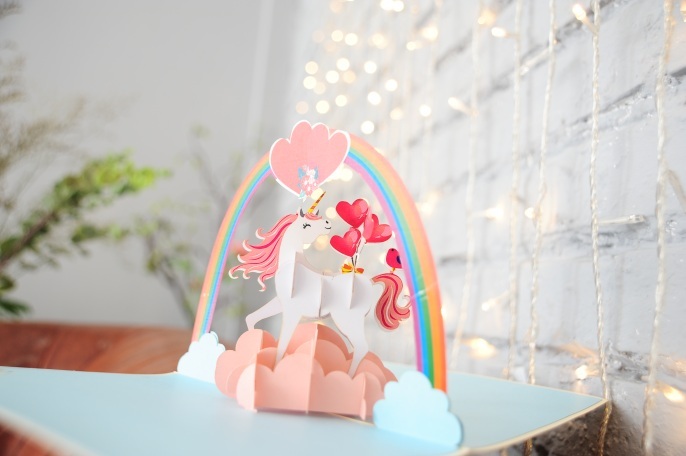 Open the card and you will find a stunning three-dimensional sculpture of a magical unicorn and the familiar rainbow, but now it’s all about love. We always leave the card blank so that you can personalize your own words. Unicorns have always seemed like mysterious creatures, and in the imagination of the young, have always held some promise of adventure. This adorable Love unicorn card is specially made with the color combo for your rainbow and unicorn loving people. Your partner will love to receive a special handwriting love message. It’s like sending one big hug from a unicorn! Our craftsmen have carefully design layers and layers of the pop-up to make the sculptures look so vibrant and bring great excitement to receivers. We hope with this simple card, you will perfectly surprise any recipients. This kirigami card with its sky blue cover that features a magical unicorn will make a perfect choice of pop up card for any people for Valentine occasion or wedding invitation, LGBT’s day or even Birthday if you like. 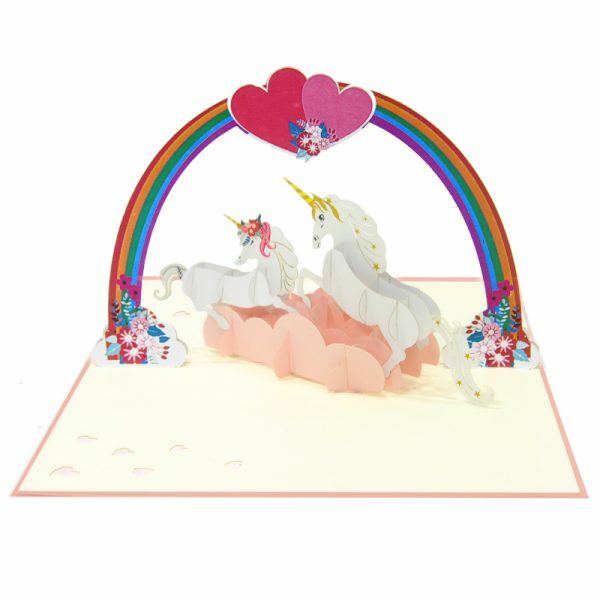 Love unicorn couple pop up card has a pink cover with some loving decorating patterns. The image hints just a little at the sweet surprise inside. 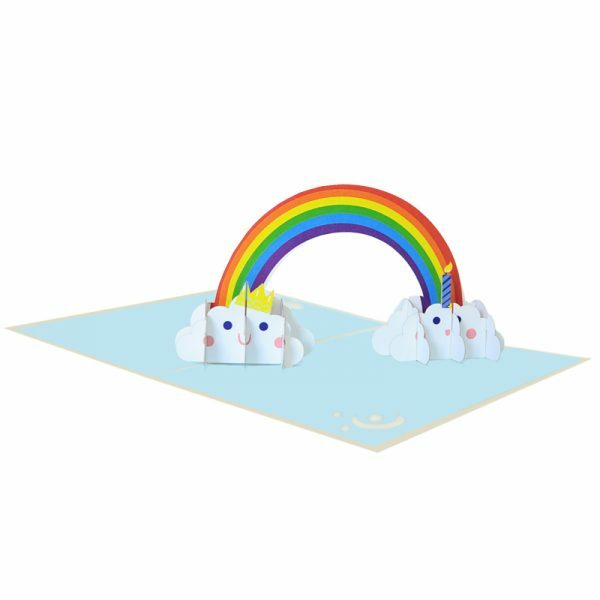 Open the card and you will find a stunning three-dimensional sculpture of a gorgeous pair of vividly colorful unicorns standing under a rainbow with loving heart shapes. We always leave the card blank so that you can personalize your own words. What will happen when two unicorns get married? There will turn up a magical rainbow! That’s the most heavenly epic marriage ever that can make this world bursting with the color of flowers and love. Our craftsmen have carefully design layers and layers of the pop-up to make the sculptures look so vibrant and bring great excitement to receivers. 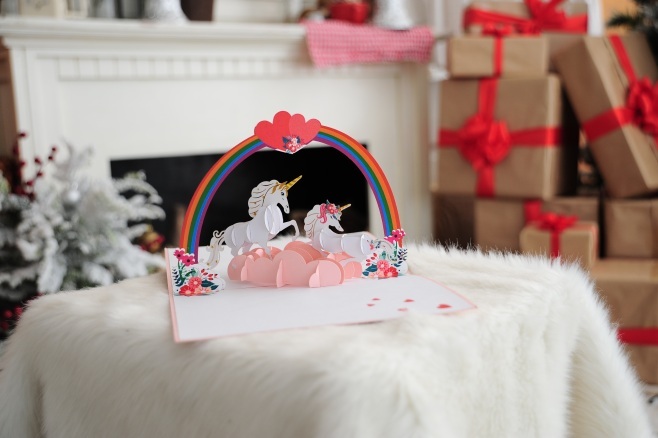 We hope with this simple Love unicorn pop up card, you will perfectly surprise any recipients. This kirigami card will make a perfect choice of pop up card for kids for any occasions such as Valentine’s day or for any couple who long for a stunning wedding invitation design. Even in LGBT’s day, you can use it as a meaningful gift for your dearest friends to express your support to her/him. 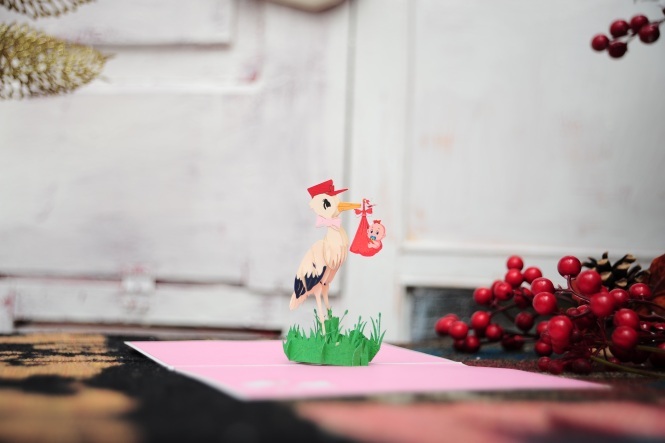 Baby stork pop up card has a white cover with a beautiful illustration of a baby stork. The image reveals a clue of what will pop up inside. Upon opening the card and you will find a stork delivering a cutie baby with contentment feeling on its face. Our craftsmen have carefully design layers and layers of the pop-up to form a perfect and lively sculpture. We always leave the card blank so that you can personalize your own words. Is there any event more exciting than the arrival of your beautiful baby? For the arrival of a new baby creates endless memories and infinite happiness. Especially, in some ancient myth, newborn babies are often depicted with a rather incongruous creature: a long-legged, sharp-beaked bird known as a stork. The image of this bird – usually with a cloth bundle dangling from its beak – has become so intertwined with infants that we barely question the stork’s ubiquitous presence on well-wishers’ cards, baby clothes, and blankets. 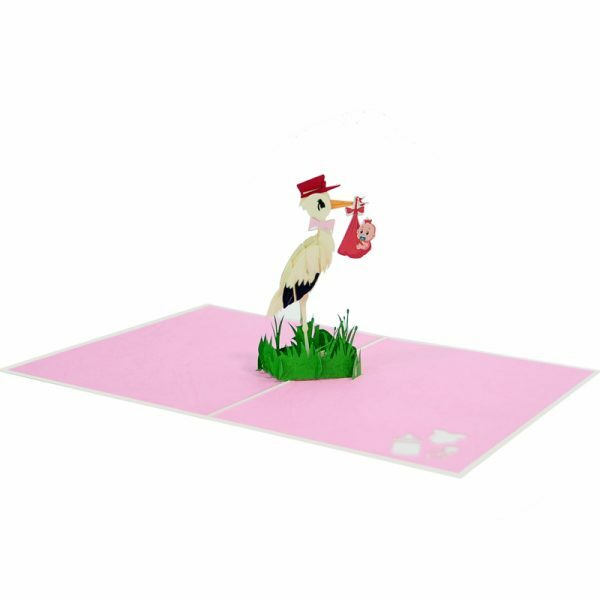 Baby stork pop up card is an unforgettable gift to celebrate this big event. Our craftsmen have carefully design layers and layers of the pop-up to construct the designs in a very lively way. Wrap together some loving wishes and deliver it to your loved ones. We hope this product could become a simple delicate gift that is perfect for celebrating new baby events. This card is perfect for a funny pregnancy announcement to surprise friends and family. Use this card to congratulate new parents. Also a great card for baby shower invitations. 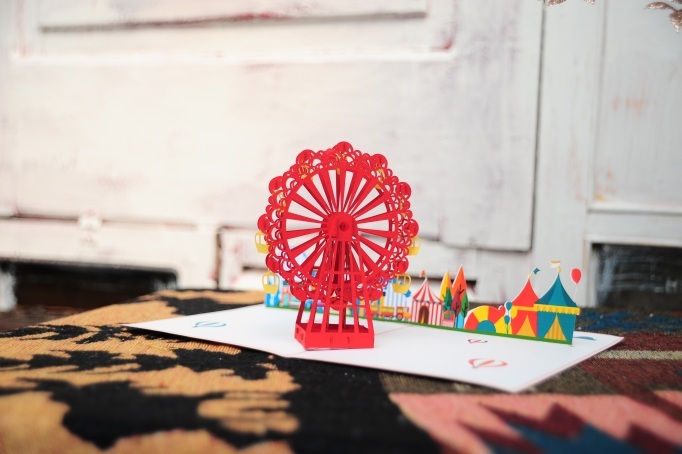 New ferris wheel pop up card has a red cover with a ferris wheel pattern. The image reveals just enough of the surprise inside. Open the card and you will find a stunning three-dimensional red sculpture of a giant ferris wheel in front of a colorful scene of park. We always leave the card blank so that you can personalize your own words. The fairground ride consisting of a giant vertical revolving wheel is one of our best favorite games at the amusement park. 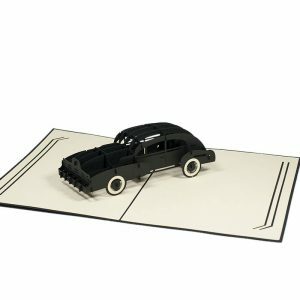 We enjoy watching passenger cars suspended on its outer edge and imagine how relaxing they feel. Thus, we believe each card tells a different story depending on how you give the card to the receiver. 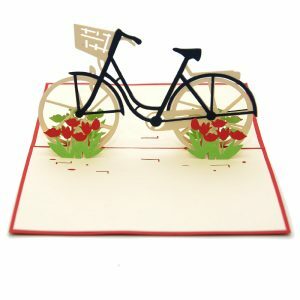 This New ferris wheel pop up card could be either a great gift for children or a love gift for any couples. Our craftsmen have carefully design layers and layers of the pop-up to make the sculptures look so vibrant and bring great excitement to receivers. 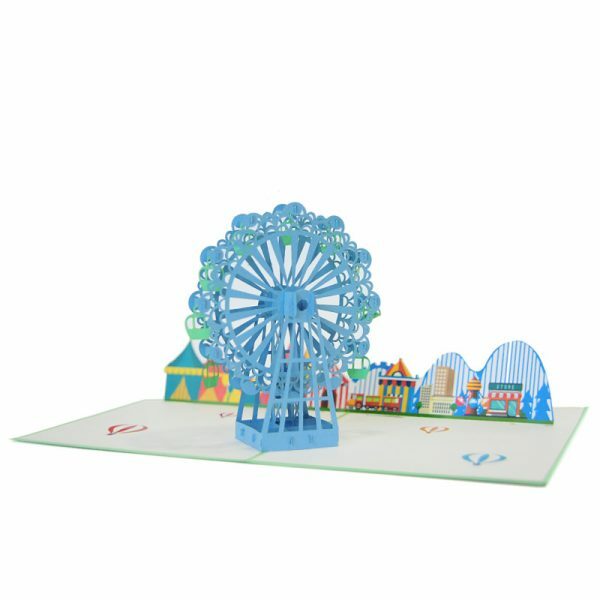 New ferris wheel pop up card is a most suitable 3D birthday gift for children, or for anyone who loves the beauty of the giant wheel. 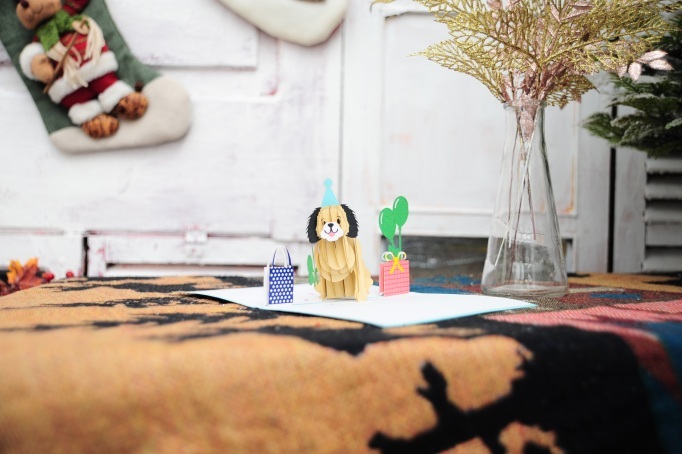 Give this handmade pop-up card to your children, friends or family on their birthday. 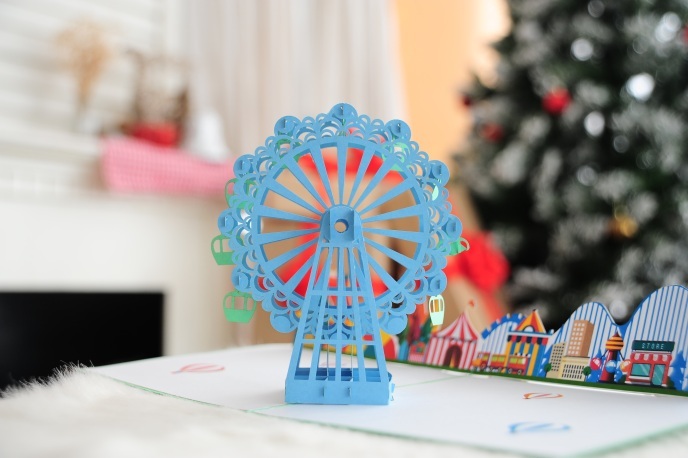 New ferris wheel pop up card has a green cover with a ferris wheel pattern. The image reveals just enough of the surprise inside. Open the card and you will find a stunning three-dimensional blue sculpture of a giant ferris wheel in front of a colorful scene of park. We always leave the card blank so that you can personalize your own words. The fairground ride consisting of a giant vertical revolving wheel is one of our best favorite games at the amusement park. We enjoy watching passenger cars suspended on its outer edge and imagine how relaxing they feel. Thus, we believe each card tells a different story depending on how you give the card to the receiver. It could be either a great gift for children or a love gift for any couples. Our craftsmen have carefully design layers and layers of the pop-up to make the sculptures look so vibrant and bring great excitement to receivers. 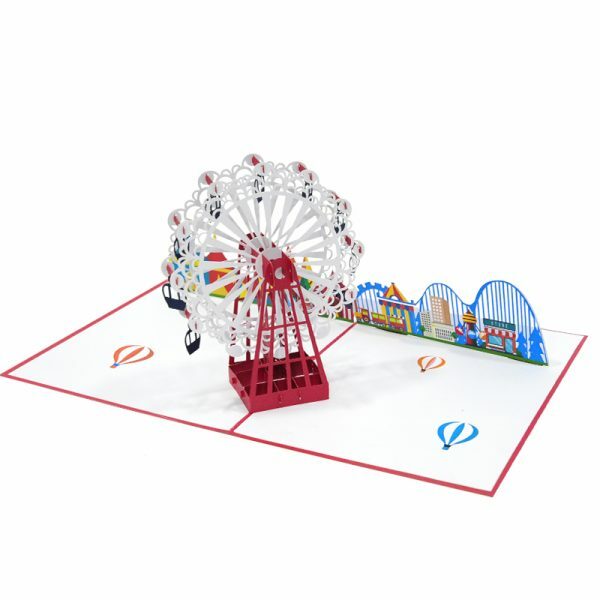 New ferris wheel pop up card is a most suitable 3D birthday gift or congratulation present for children, or for anyone who loves the beauty of the giant wheel. 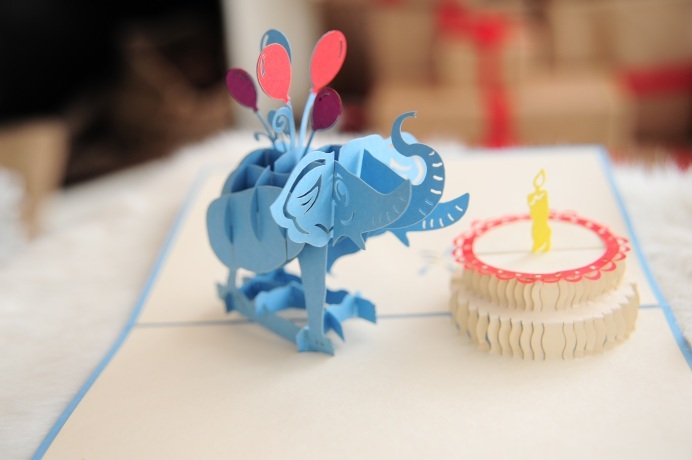 Give this handmade pop-up card to your children, friends or family on their birthday. 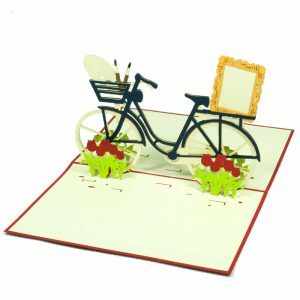 This entry was posted in Pop up cards -Blog Charmpop and tagged 3D cards, animal pop up cards, anniversary pop up cards, birthday pop up card, Christmas, father's day pop up cards, graduation pop up cards, kids pop up cards, love pop up cards, mother's day pop up cards, new baby pop up cards, New design, New design pop up cards, new release, new release pop up cards, thank you pop up cards, Thanksgiving, unicorn, valentine pop up cards. These cards are wonderful. I have people always asking me where do I find them. I just direct them to your site. 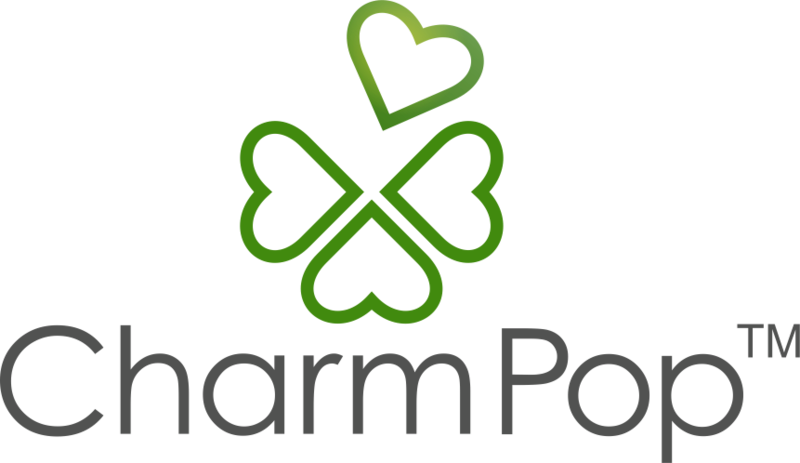 Your Charmpop cards have brought my family smiles, laughs and great memories. Happy Holidays to you and your artists. 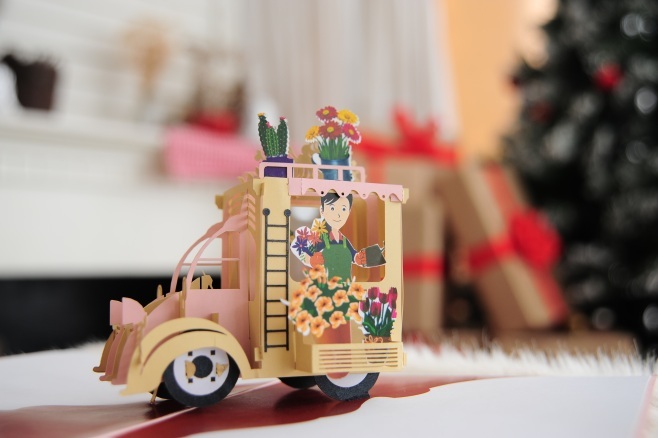 Hey Buddy!, I found this information for you: "NEW DESIGN POP UP CARDS COLLECTION – [DECEMBER 2018]". Here is the website link: https://charmpopcards.com/new-design-pop-up-cards-collection-december-2018.html. Thank you.